Omiwa is said to be dancing on a bridge near the Ataka barrier in order to secure safe passage. With a storyline based at this historical spot, the Kabuki Performance of "Kanjincho" and the Noh Performance of "Ataka" help make the "Ataka-no-seki"site famous and popular. 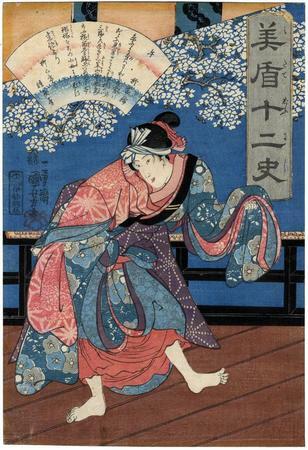 The story took place in 1187 (Bunji 3), with the main character being Minamoto no Yoshitsune. After Yoshitsune distinguished himself in the battle of Heike and defeated the Taira Clan, Yoshitsune aroused anger of his brother, Minamoto no Yoritomo, and was hunt down by Yoritomo. Yoshitsune decided to flee and join the Fujiwara Family in the Hiraizumi (Tohoku area). With his servants and followers, the twelve of them disguised themselves as Buddhist monks and headed for the Ataka-no-seki checkpoint. Togashi Saemon Yasuie, who was the head of the gatemen at the Ataka-no-seki checkpoint, was touched by Benkei's (one of Yoshitsune's servants) courage and loyalty he paid to Yoshitsune when Yasuie saw through their disguises, so in the end Yasuie decided to let them go instead of turning them in to Yoritomo. The Barrier Site now is surrounded by pine trees and is located on a small hill facing the Sea of Japan.